When you see the Japanese L0 Series maglev train at full speed, it can be hard to spot the potential (extremely costly) failure. Some of that is down to speed. Propelled by superconducting magnets, a maglev train set a world record of 603 kilometers per hour in 2015. If you could put it on a freeway, that speed would take you from San Francisco to Los Angeles in just over an hour. New York to Washington DC would take a little over 30 minutes. These kinds of travel times are a core reason why several interest organizations in America are pushing maglev trains as the railway technology of the 21st century. Others are not so enthralled and question the trains’ economic viability, citing construction costs and worries about long-term profitability. While maglev trains will fly through the Japanese countryside within the next 10 years, they risk being overtaken by self-driving cars, or Elon Musk’s Hyperloop. So, what is it about the technology that has led Japanese companies and the country’s government to spend more than $82 billion on constructing what will be the world’s first large-scale maglev train line? Furthermore, will it be a success, or a costly failure? These questions and worries are drowned out by droning construction machines that have been chewing their way through the Japanese alps since 2014. One task involves constructing a 25-kilometer-long tunnel, which at its deepest point will be 1.4 kilometers below the mountain massifs above. It’s an impressive task on its own, but pales in comparison with the overall project: connecting Tokyo and Nagoya with custom-made maglev rails. Over 85 percent of the 286-kilometer route will be underground tunnels. If everything goes to plan, the first trains will zoom between the cities by 2027. The next stage involves laying a further 152 kilometers of rails to Japan’s second-largest city, Osaka. The entire project is expected to be completed in 2045. While not the first fully operational commercial maglev train line, which is in China, the Japanese project dwarfs any other and is by far the most ambitious implementation of the technology—a full-size proof of concept, if you will. Maglev is an abbreviation for “magnetic levitation.” Up to about 150 kilometers an hour, the Japanese trains run on wheels. After that, magnetic forces take over, and thanks to superconducting niobium-titanium magnets, cooled to -450 degrees Fahrenheit, the trains will float about ten centimeters above the rails. Magnets not only provide lift and propulsion, but also keep the train stable. Without friction between rails and wheels, maglev trains are characterized by high acceleration, stability, operating speeds of up to 500 kilometers per hour (in the case of the Japanese project), long lifespan, and low maintenance costs. Apart from adding capacity to the Japanese public transportation network, cutting travel times and thereby increasing efficiency for Japanese workers, the plan is for the maglev trains—and their associated technology—to become an export adventure. The US is the main target, and obvious opportunities exist, especially on the East and West coasts, where aging transport infrastructure and increased transport needs both bolster the case for maglev. So far, the response from politicians in the US has generally been lukewarm. Perhaps partially because of doubts as to whether the technology is as economically viable as the Japanese government may think. One factor is construction costs. Maglev trains need special tracks, so existing infrastructure doesn’t work. Critics say that constructing a maglev route costs up to five times that of a normal train route. Then there is the still somewhat unproven nature of the technology, as well as questions about whether it makes economic sense to invest so heavily in a form of transportation that could see increased competition from other technologies in coming decades. However, in neighboring China, the Shanghai Transrapid, a maglev train system, is trying to put some of those fears to rest (while simultaneously being described as a white elephant). The train connects the city center and airport, reaches 350 kilometers in two minutes, and has a maximum driving speed of 431 kilometers per hour, making it the fastest operating train in the world. 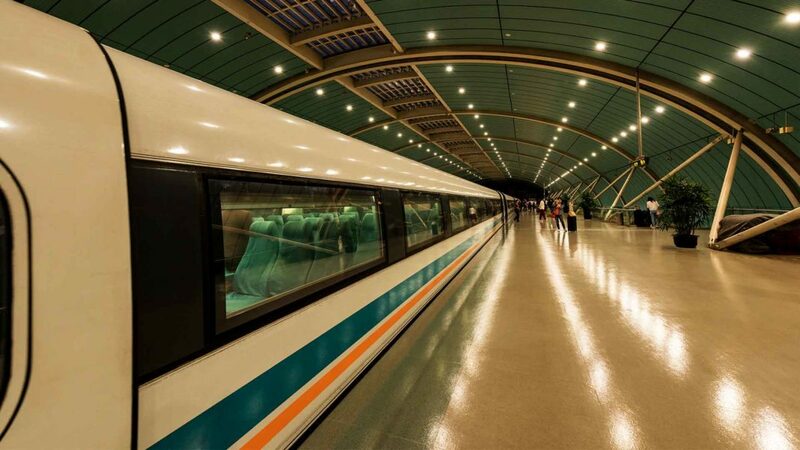 The 30 kilometers from downtown Shanghai to the airport are completed in 7 minutes and 20 seconds. According to calculations, the maglev train uses less energy than a German ICE 3 train at speeds over 350 kilometers per hour. Henrik Sylvan believes that the construction of maglev track systems need not be as expensive as the Japanese example, where the tunnels are a massive part of the total cost. At the same time, some of the higher costs of maglev trains may potentially be offset by shorter transport times, with socio-economic benefits that can boost regional growth and development. And maglev’s speed means those regions may be expanded to areas that would otherwise be considered too far apart. “On some stretches, a maglev system could be faster than flying,” Sylvan said. To summarize, the jury is still out on maglev. In the meantime, other transportation technologies are building momentum, which could hamper maglev trains’ future potential. Self-driving cars are one example, which have the benefit of being able to make use of existing infrastructure. The price per car is also much, much lower. Hyperloop promises speeds higher than maglev trains and, on paper, some believe it will come with somewhat lower construction costs. However, it is still a very new technology. Finally, flying cars are seeing renewed focus and interest (I’m old enough to remember when the Moller Skycar was first announced, so let’s wait and see what happens there). While likely expensive, they have little to no need for infrastructure. The question remains open as to whether the public’s preference for any of these modes of transportation would get in the way of what is, to some extent, both maglev trains’ biggest strength and weakness: their communal nature. Maglev trains can pack in a lot of people and whisk them from one place to another at speeds that are on par with the hyperloop, far outperforming the likely speeds of self-driving cars—or even flying cars, for that matter. However, they only make economic sense if there are a lot of people willing to travel on them. That is one of the litmus tests we are, to some extent, still waiting for an answer to—and the answer likely won’t come until Japanese commuters start going from Tokyo to Nagoya.